Jennifer was visiting us after the Leon 10-year reunion when Winston called to ask if she'd like to go to London. His work as a developer of project management software was taking him to a temporary position at a large bank in a London suburb. Jennifer was eager to go with him, and I quickly decided I should drop in a visit them while they were there. And I couldn't go to London without going next door to Wales, where my Morgan ancestors originated. There were some other trips to make before we could all get together (me to Nebraska, them to Vancouver), but they made it there in late August and I left for London on September 19. This map shows the British Isles. 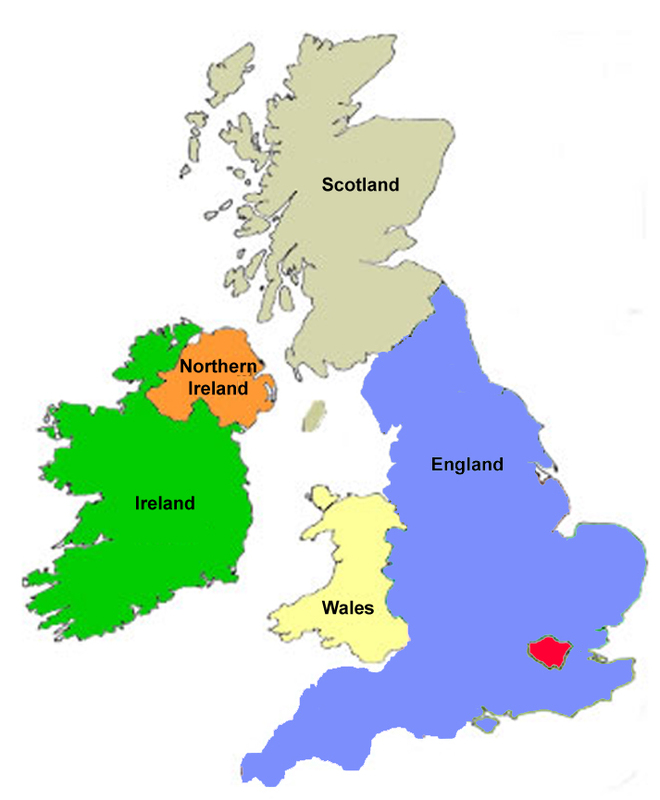 The United Kingdom of Great Britain and Northern Island includes all but Ireland. London is the red area in southeast England. Here are links to photos and descriptions of what I did while in the UK. Not all of the links are active yet, as I'm still building the site.